Author’s note: President “Pepe”. When used like that, it sounds like an electoral slogan. 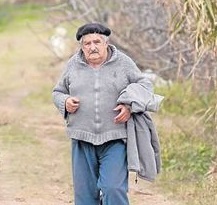 But Jose Mujica is about to conclude – on Mar. 1 – his term as President and he’s more “Pepe” than ever. In more than half a century as a journalist, I have had the opportunity to meet or mingle with all manner of leaders, from Ronald Reagan to Raul Alfonsín, to Fidel Castro, Mijail Gorbachov, “Lula”, François Mitterand, Sandro Pertini, Michèle Bachelet and Carlos Menem, but “Pepe” breaks the mold. On Feb. 11, at 10:00 in the morning, the Swiss journalist Camilla Landbö, photographer Oscar Bonilla, coordinator Fasano Mertens, presidential press secretary of Uruguay Joaquín Costanzo and myself arrived at “Pepe’s” very simple, blooming farm just a few miles outside of Montevideo. Out comes the President to greet us wearing his untucked button-down with sleeves rolled up over a pair of jeans, shoes half untied and a baseball cap. He says hello, exchanges handshakes, and we sit down under a tree where he grabs a thermos and begins to serve “mates” for the whole crew. Every now and then he interrupts to ask Bonilla for some tobacco and paper to roll up a smoke. But in spite of what this description might suggest, there was not a bit of posing, or anything picturesque about “Pepe” Mujica. Breathing, sweating, he exudes an authenticity demonstrated in all aspects of his life and, of course, by his deeds and words. He freely expresses the limitations and problems of his administration in an intellectual style with an everyman touch. “Pepe” is one of those rare Marxists that gets the humanist materialism of Marx and attempts to make it relevant to today’s world. A cultured and profoundly honest and sincere man, whether you agree or disagree with what he says. 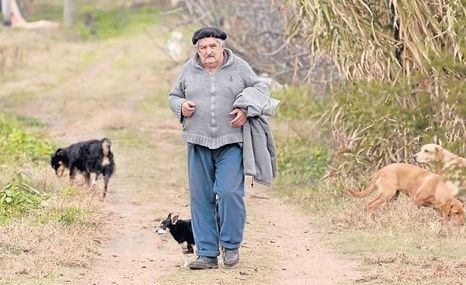 “Pepe”, President of the Eastern Republic of Uruguay. C.G.